Getting to Savute by light aircraft is a breeze. 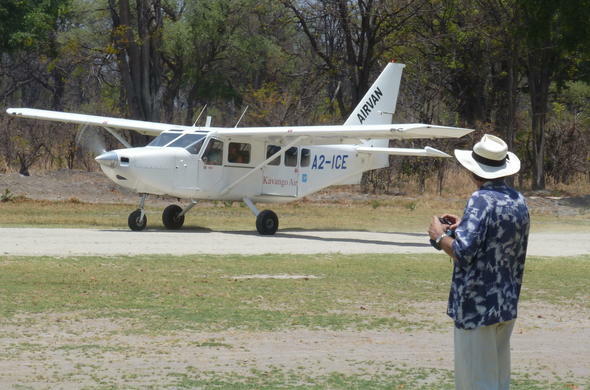 All of our Siyabona Botswana safaris include flights to and from, and between the various lodges you are staying at. If you have elected to a self-drive, this article is for you... Savute (or Savuti) can be broken up into two distinct regions - the Channel and the Marsh. Fed by the Linyanti the Savuti Channel flows through the Linyanti concession before entering the Chobe National Park in the region of the Savute Marsh. The only part of the channel accessible to the general public is the final section before it ends in the Marsh. The section of the channel in the Linyanti concession is private and only accessible to those who are staying in the lodges in the area. Getting to Savute is only possible by air or by four wheel drive vehicle due to the state of the access roads. There are two routes from the north that can be taken to access Savute, the first being the road that turns off the main Kasane - Namibia route and passes through the villages of Kavimba and Kathikau, reaching the Gocha Hills before arriving in Savute. The second route, although more or less the same in distance takes longer due to the slow going on the roads. This route travels via the Nogatsaa and Tchinga public areas. The route to Savute from Moremi travels along the Khwai River and soon after entering the Chobe National Park the route heads north with a choice of taking the often hostile Magwikhwe Sand Ridge or driving via Mababe Village. The roads meet on the edge of the Mababe Depression from where the vast flat area of the Depression spreads out until reaching Savute. To reach Savute from Maun the road heads north via Shorobe, bypassing Moremi Game Reserve, and reaches Mababe Village where it meets the road from Moremi. There is a small section of the Chobe National park that attaches to the Linyanti system with a public campsite and to access Savute from here there is only one main route open to the public that heads south to the Marsh. View a map of Botswana with Camps and Lodges in Reserves.